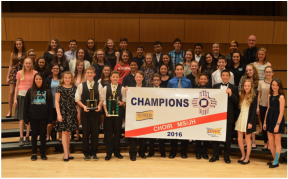 2016 NMAA Middle School State Champions!! Assessment Festival. Fantastic job done by all! Best Show at the 2016 West Mesa Stampede of Stars! Dallin Gariety wins Best Male Soloist!!! 2016 La Cueva Show Choir Invitational! Five Star won 1st place in the mixed division and Mike & Ikes and Starburst took 1st and 2nd in their division!